How to Start Dropshipping Business? 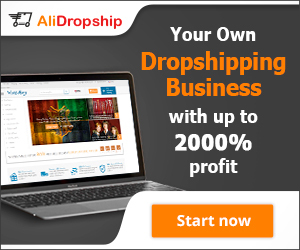 How to start Dropshipping business online? Drop shipping is fast gaining the popularity among the aspirants of online internet marketing business. This is due to its economic viability. You can start drop shipping business online even if you are low on budget. Dropshipping is an online business for selling other merchant’s product without actually maintaining the stock inventory. You can buy the product once it is sold and let the merchant ship it directly to the buyer’s address. 1 Select a niche or product of your choice if the first step to start dropship business online. If you need help in selecting a profitable online niche, you can just read my post on How to select most profitable niche. 2. Once a niche is selected, you should find a supplier for the product on suppliers marketplace like Ali express to start drop shipping business online. 3. Next step involves setting up your own website or e-commerce store. You can either set up a content-driven website or just an online store. You can build your free website with site Rubix or may choose a platform like Shopify. Shopify charges a monthly fee for hosting. On Shopify, you can use a plugin like Oberle for importing products from Ali express. So if you are looking forward to setting up an e-commerce store, I would recommend you to get registered with Shopify but if you are more keen to start a content-driven site, you can use siterubix for developing your site on word press and later you can install woo commerce and other plugins to import product from Ali express. 4. After setting up your store, you can start promoting it either through social media or can use search engines like Google AdWords or Bing Ads. But if you have started with the content-driven website, You can write articles to drive organic traffic free using on-page SEO. You can follow my best tips for SEO in 2018, here. 5. Once a customer buys the product on your website and pays for it, you can place an order on merchant and share your customer’s address with the merchant. 6. You get the tracking ID from the merchant and pass it on to the buyer. Buyer receives the product in due course of time. The biggest advantage with the drop ship model is that you are not required to hold any inventory. You purchase the product after you have sold it. Only capital required for starting the Dropship business is to buy a domain name and web hosting. You can use site builder from siterubix or Shopify to build your own website without any experience. Dropship business is relatively easy to start. You can build the store probably in a few hours to get started. If you are hesitant to build your first store yourself. you can hire a developer from Fiverr and can get your store build up for $25 with all the products of your choice integrated. Once a store is set up, you may get your first sale sometime within hours of setting up the store and sharing it on your Facebook. Keeping and managing inventory stocks. Handling any type of returns and replacements. You can then devote your time to promote and research on the marketplace and keep on adding the popular products. Once you have set up your store, the only requirement would be a laptop and internet connection. As per your budget, you can decide on your monthly advertisement cost. So you can run this business for less than $100 per month. Once your store start getting the traffic and you have to build a reputation with your customers, you can keep on adding new products and since you have the customer’s database, you can promote your new products also to the customers and get repeat orders from them. Once you start earning you can increase your advertisement budget and grab more customers. As a drop shipper, you control your own profit and margin. Yo decide your retail price and you can anytime run promotional activities offering some discount to customers. Once you are established in the market, you can better negotiate with the suppliers for further discounts as well. If you start drop shipping business online, the biggest advantage of not keeping the inventory sometimes become a disadvantage as well. As the merchants are fulfilling the order of other sellers also, it may happen some time that they may not have the inventory to fulfill your order. Such a scenario can be avoided by finding more than one resource for the same item. Since you are sourcing the different items from different merchants, it may sometimes lead to shipping complexities. Once the buyer place order for more than one item at the same time, you may not be able to combine the shipping for all these items as per the expectation of your buyer and you can not charge shipping expense for all the three items separately. Some time supplier can dispatch the low-quality items to your customers. Such scenario though cannot be avoided but can be controlled by finding higher rating seller in the marketplace. Dropship business has its advantages and disadvantages as explained above. Dropship business may not be a perfect business but you can start drop shipping business online at a low cost and it can be operated from home. In my opinion of view, the beat low-cost home based business is Affiliate marketing which has all the advantages of a drop ship model and carries no disadvantage of this mode. You can follow my step by step training for starting affiliate marketing.